Compatibility is a key element in any relationship. And it’s also one of the most important components of the omnibus tax bill presented at Tuesday’s House Taxes Committee meeting. Since the session’s start, a common claim has been that the committee’s chief charge is making state tax law compatible with changes brought about by the federal Tax Cuts and Jobs Act signed into law in December of 2017. 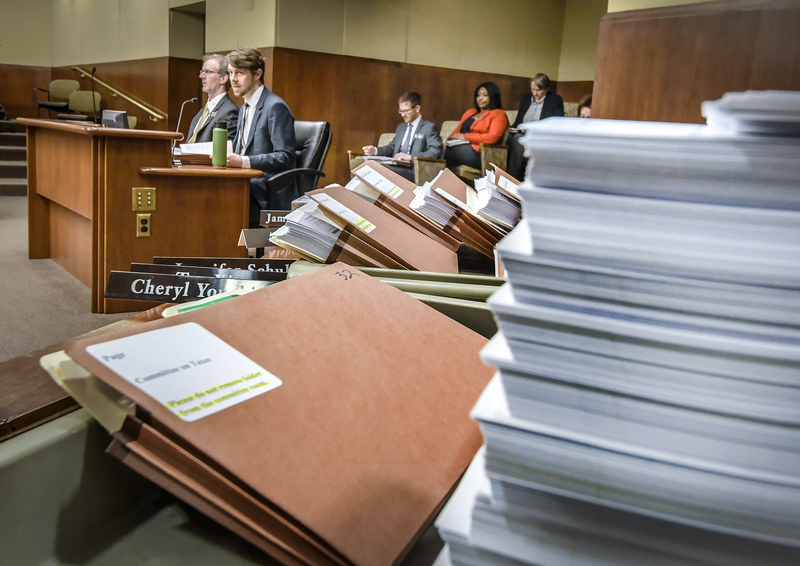 Sponsored by the committee’s chair, Rep. Paul Marquart (DFL-Dilworth), HF 2125, as amended, has several provisions that would make filing simpler by having state law mirror federal. The Department of Revenue estimates that, if the bill were adopted, total General Fund tax revenues would come to $46.06 billion for the next biennium, with $3.74 billion in property tax refunds, aids and credits returned to taxpayers. For individuals: Federal adjusted gross income would become the new starting point for figuring state individual income tax. The standard deduction would match federal amounts, meaning $24,400 for those married filing jointly, $12,000 for singles. For businesses: Cash basis accounting would be more widely available to businesses. Section 179 expensing for qualifying equipment purchases would be expanded, as would bonus depreciation rules. There would be new limits on business interest deductions and the use of active losses to reduce other income. Carrybacks and carryovers for net operating losses would be either limited or eliminated. Meals, lodging and certain transportation costs would no longer be business expense deductions. And employers could no longer deduct employees’ moving expenses. The bill doesn’t conform to the TCJA’s GILTI provisions (that’s “global intangible low taxed income”), meaning the state would have its own statutes concerning how foreign income is taxed. Deductions for property taxes paid over $10,000 would be disallowed, as would those for interest from home equity or acquisition indebtedness over $750,000. a state deduction for personal casualty and theft losses. freeze the estate tax exclusion at $2.7 million. The bill would increase the school building bond agricultural credit, the renter’s credit, the homestead credit refund, and funding for city local government aid and county program aid. It would extend the Public Employees Retirement Association program, establish an annual appropriation for the border city enterprise zones, and modify distributions for the Taconite Municipal Aid Account. Changes would be made in local option sales tax and tax increment financing and bonding authority that mirror very closely what was contained in the House Property and Local Taxes Division report. The bill would clarify how to collect and remit sales taxes for remote sellers and marketplace providers, and alter the current exemption for data centers. It would also provide sales tax construction exemptions for several local government construction projects and nonprofit organizations, fire departments and county fairs, and provide a temporary sales tax exemption for film production. Among other changes that might alter property taxes, the bill would clarify how fractional ownership is determined; allow agricultural classification on land used for certain environmental purposes; and allow a city or town to fund its own historical society. HF2125 would increase the rates of the solid waste management tax in counties with soil and water conservation districts; reinstate the annual adjustment to the cigarette excise tax; and allow the shipment of up to 12 cases of wine from direct ship wineries. The House Taxes Committee will discuss proposed amendments to the bill on Wednesday and refer the approved bill to the House Ways and Means Committee, where it is scheduled to be considered on Friday. 'Starting Line:' Would you choose to pay more at the pump?